Today is Lammas, the earliest Anglo-Saxon harvest festival of the year. Its name comes from Old English hlaf, 'loaf' and mæsse, 'mass', and it may have been a day when loaves of bread made from the first corn were blessed. Much about the origins of Lammas is obscure, but it's a festival with a long, interesting and somewhat unusual history. This means Lammas is often said to be a pagan festival (and it has been adopted as such by neo-paganism, where it seems to be considered as interchangeable with Lughnasadh). Historically speaking, that's an over-simplicification. Despite its likely pre-Christian origins, the name 'Lammas' is both Christian and English: the second element -mæsse ('mass') was borrowed into Old English from liturgical Latin, and is only used to refer to Christian or Jewish festivals. In the Anglo-Saxon period and long afterwards it was endlessly productive as a suffix, giving us not only names we still use, like Christmas and Candlemas, but an almost limitless variety of Christian festivals with comparable names: Childermas, Marymas, Petermas, Ellenmas, Lukesmas, Hallowmas, Roodmas, Crouchmas, and so on. It seems unlikely that it would be used for a festival which was perceived to have a substantial non-Christian component. Similarly, our few references to Lammas are from fairly late Anglo-Saxon texts, and survive in a learned Christian context (as you would expect from the nature of the surviving sources). 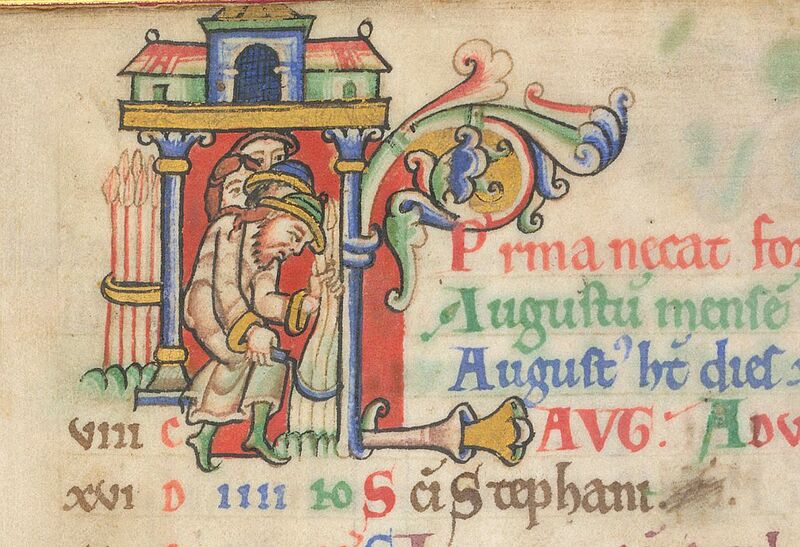 Lammas doesn't regularly appear in Anglo-Saxon calendars or liturgical books, where August 1st is instead the feast of St Peter ad Vincula and/or the Maccabees, but there are various intriguing references to it. The earliest may be in the Old English Martyrology, probably dating to the ninth century, which doesn't use the name Lammas but does refer to 1st August as the day of hlafsenunga, 'blessing of bread'. It's worth noting that senung, which is related to the verb segnian, 'to make the sign of the cross', is another borrowing from ecclesiastical Latin (signare), so we're no closer to finding any pre-Christian terminology here. The first recorded use of the word Lammas itself is probably that in the Old English Orosius, which refers to 1st August in passing (while telling the story of Antony and Cleopatra) as 'the day that we call Lammas'. This text likely comes from the last decade of the ninth century, and that late date is interesting - it's already a good few centuries later than our usual authority on pre-Christian Anglo-Saxon customs, Bede (who doesn't mention Lammas). All the references to Lammas in the Anglo-Saxon Chronicle - again, simply as another name for August 1st - are from the tenth, eleventh or twelfth centuries. 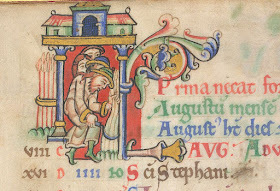 The homilist Ælfric, usually such a helpful guide to the cycle of the church year, also only mentions Lammas as an alternative name for 1st August: he refers to it it in passing in a homily about St Peter, telling his congregation that 1st August is the day 'you [not 'we'] call Lammas'. This might suggest he thought of it as primarily a secular rather than a religious occasion (though not a pagan one, or he probably wouldn't mention it at all). Perhaps by this time it was an extra-liturgical custom, adopted and supported by the church but not incorporated into the liturgy. If it was a day when people brought loaves to church to be blessed, we don't have any record of specific blessings attached to Lammas, though there are general blessings for bread and crops which might have been used. According to the system of dating used by this tenth-century poem, the season of autumn began shortly after Lammas on August 7th - a date calculated by its position halfway between the summer solstice and the autumnal equinox. I've written about this dating system before, and I wrote about some Old English harvest poetry in a post last year. This poem unfortunately tells us nothing about Lammas except that it comes 'to peoples everywhere' (which is actually far from true, since it was such a localised festival!). But you can see how closely it coincides with the coming of harvest/autumn - the Old English name for autumn is hærfest, so they're the same thing here. 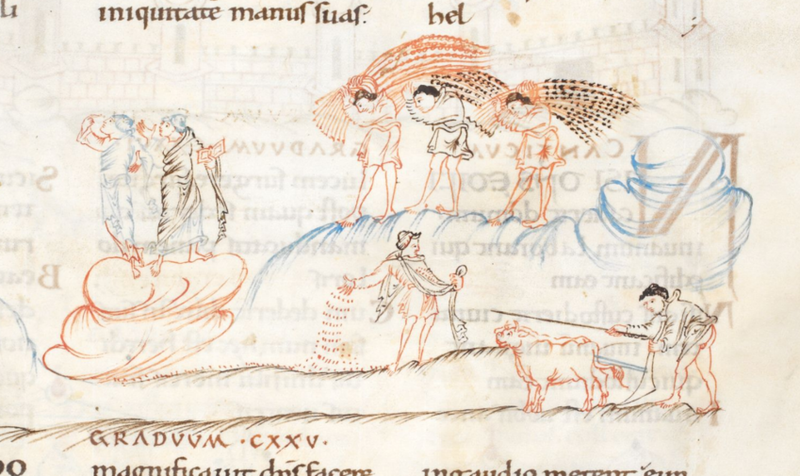 The link between autumn and harvest is one thing which makes the Anglo-Saxon view of this season quite different from our modern perspective. Think of autumn and you might think of reddening leaves, dewy chilly mornings, darker shorter days - probably not of harvesters working under a blazing August sun. But in Old English, linguistically speaking at least, autumn and harvest are indistinguishable. [...] lange sticcan feðerecgede 7 writ on ægðerne sticcan[...] ælcere ecge an pater noster oð ende 7 lege þone [...]an þam berene on þa flore 7 þone oðerne on [...] ofer þam oðrum sticcan. þæt þær si rode tacen on 7 nim of ðam gehalgedan hlafe þe man halgie on hlafmæssedæg feower snæda 7 gecryme on þa feower hyrna þæs berenes. þis is þeo bletsung þærto. Vt surices garbas non noceant has preces super garbas dicis et non dicto eos suspendis hierosolimam ciuitate. ubi surices nec habitent nec habent potestam. nec grana colligent. nec triticum congaudent. þis is seo oðer bletsung. Domine deus omnipotens qui fecisti celum et terram. tu benedicis fructum istum in nomine patris et spiritus sancti. amen. 7 Pater noster. [Take two] long pieces of four-edged wood, and on each piece write a Pater noster, on each side down to the end. Lay one on the floor of the barn, and lay the other across it, so that they form the sign of the cross. And take four pieces of the hallowed bread which is blessed on Lammas day, and crumble them at the four corners of the barn. This is the blessing for that; so that mice do not harm these sheaves, say prayers over the sheaves and do not cease from saying them. 'City of Jerusalem, where mice do not live they cannot have power, and cannot gather the grain, nor rejoice with the harvest.' This is the second blessing: 'Lord God Almighty, who made heaven and earth, bless these fruits in the name of the Father and the Holy Spirit.' Amen. And [then say] a Pater Noster. Quoted from Karen Louise Jolly, 'Tapping the Power of the Cross: Who and For Whom? ', in The Place of the Cross in Anglo-Saxon England, ed. Catherine E. Karkov, Sarah Larratt Keefer, and Karen Louise Jolly (Woodbridge: The Boydell Press), p. 79; my translation. 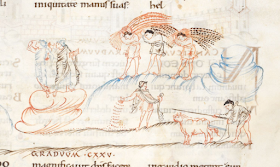 The manuscript from which this charm comes, British Library, Cotton Vitellius E xviii, is a psalter, written in a monastery at Winchester in the middle decades of the eleventh century. This charm survives alongside other prayers and rituals and an assorted collection of highly useful information: good and bad days for bloodletting, how to cure sick cattle and sheep, how to keep people from stealing your bees, the most lucky days for childbirth, and so on. A list can be seen here. Although to modern eyes this kind of ritual often looks like pagan folk-magic, it's part of a complex picture of popular and learned devotion in early medieval England; this particular ritual might well have been performed by a priest, and it's made up of explicitly Christian symbols and practices - the cross, the Pater Noster, and the consecrated bread. This charm suggests that there was something special about the bread blessed at Lammas, but it might plausibly refer to the Eucharist consecrated at a mass said on Lammas Day rather than to specific Lammas loaves. Well, that was an exhaustive history of the Anglo-Saxon sources! Let's skip over the next seven centuries a bit more quickly. Later in the medieval and into the early modern period Lammas seems to have retained this kind of quasi-official status, acting mostly as a fixed date for various secular customs rather than being celebrated as a festival itself. 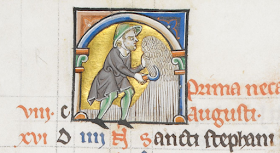 It was still commonly used as a name for August 1st and sometimes for the whole month of August; often it seems to be simply another name for 'the season of harvest'. Some later medieval writers understood the name to be 'Lamb-mass' (festum agnorum) and thought it had something to do with lambs, which suggests they didn't recognise the 'loaf' element or the connection with bread. Others treat 'Lammas' as if it were a name for the feast of St Peter in Chains, the feast more widely celebrated in medieval Europe on this day. In the fifteenth century John Lydgate, summarising the festivals of summer, includes in his poetic list 'Petrys cheynes wer brooke in prysoun, / The feeste therof callyd Lammesse', while his contemporary John Capgrave writes of 'the feest of Seynt Petyr, whech thei clepe in Latyn, 'ad vinculam', in Englisch, 'Lammesse''. latter Lammas, a day that will never come. at latter Lammas: humorously for ‘never’. 1567 GASCOIGNE Instruct. Making Verse Posies (1575) Many writers...draw their sentences in length, & make an ende at latter Lammas. 1576 GASCOIGNE Steele Glas. This is the cause (beleue me now my Lorde)...That courtiers thriue, at latter Lammas day. 1642 FULLER Holy State. IV. xv. 316 This your will At latter lammas wee'l fulfill. a1734 NORTH Lives of Norths (1826) I. 4 The very expectation of them puts me in mind of latter Lammas. 1805 W. TAYLOR in Ann. Rev. III. 244 This convocation was somewhat unbecomingly postponed to latter Lammas. 1857 KINGSLEY Two Years Ago vii, A treatise...which will be published probably...in the season of Latter Lammas, and the Greek Kalends. In some English towns you still find fields and meadows called 'Lammas land', areas of common land where people could pasture their animals for a fixed season running from Lammas until the following spring. Above and below are the Lammas Lands at Godalming in Surrey, looking particularly beautiful in August last year. 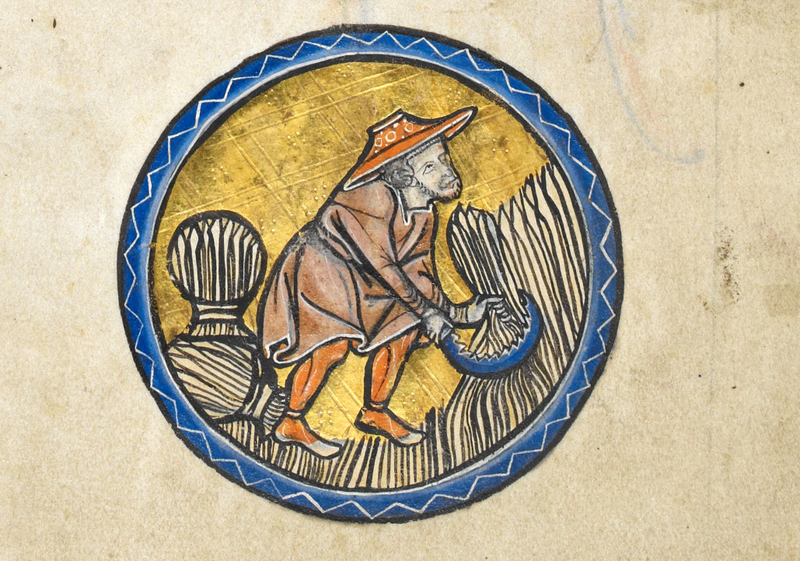 I love those two phrases, 'latter Lammas' and 'Lammas lands' - while mundane enough in their definitions, both have an irresistibly poetic ring! And there's also the beautiful phrase 'Lammas growth' (also called 'Lammas leaves' or 'Lammas flush'), which is the name given to a renewed spurt of growth which occurs in some trees around early August - a second shoot of greenness following after the first burst of spring. A flush of fresh growth in a mature tree - isn't there a poem waiting to be written in that? This is a wonderful puzzle of a festival. 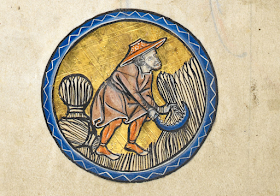 On the one hand, we have abundant evidence for its history over many centuries, from the Anglo-Saxon monk who wrote the Menologium to the keen eye of the gardeners looking out for 'Lammas growth', from the witty sixteenth-century courtiers joking about 'latter Lammas' to the cherished land-rights of medieval villagers. On the other hand, we have very little evidence for the celebration of the festival itself. But however obscure its origins, it's a day which has had meaning, of many different kinds, to a variety of people and communities for more than a thousand years. Lammas, also called Lughnasadh, comes at the beginning of August. It is one of the Pagan festivals of Celtic origin which split the year into four. Celts held the festival of the Irish god Lugh at this time and later, the Anglo-Saxons marked the festival of hlaefmass - loaf mass or Lammas - at this time. For these agricultural communities this was the first day of the harvest, when the fields would be glowing with corn and reaping would begin. The harvest period would continue until Samhain when the last stores for the winter months would be put away. Although farming is not an important part of modern life, Lughnasadh is still seen as a harvest festival by Pagans and symbols connected with the reaping of corn predominate in its rites. This is OK for what it is, but notice how it elides everything between early paganism and modern pagan practice (and how 'still seen' suggests an unbroken continuity of practice which isn't there; the modern version is a reconstruction, of course). That's a huge period of time just skipped over, jumping more than a thousand years from the pre-Christian period to the twentieth century - and what's ignored is everything in the sources discussed above, including all the Anglo-Saxon sources. Typically, it also treats 'Lammas' and 'Lughnasadh' as if they are basically interchangeable names for the same thing, which is not just an oversimplification but also a bit culturally tone-deaf; even if they have linked origins, the Irish and English festivals actually have quite different histories, and have to be understood within their different cultural contexts. I'm very glad that there are people today who celebrate Lammas, and for whom it has a sacred significance - I don't want to disparage that at all. But from a historical point of view, we should be careful about ignoring such a great swathe of recorded history just because it doesn't fit with modern black-and-white ideas of what is 'pagan' and what is 'Christian'. To modern eyes, a harvest festival somehow looks pagan - but that doesn't mean it is, and the assumption that it must be reveals more about us, and our impoverished view of the natural world, than it does about the past. I'm conscious of this danger because I write fairly often about the seasons and the natural year in medieval literature, and although many readers seem to find this subject as interesting as I do, a small minority react very oddly and aggressively to it. For me, it's fascinating to see how medieval writers thought about and wrote about the seasons, and especially to try and tease out the kinds of meaning - poetic, religious, spiritual, philosophical or scientific - which they found in seasonal cycles. This is the theme of some of the loveliest poetry in Old and Middle English, as well as some intriguing examples of medieval science. Because almost all surviving medieval English literature (my particular interest) was written down in a Christian culture, such poetry and science are often framed in explicitly Christian terms. This upsets some people very much. These people take the view that interest in natural cycles, or the natural world as a whole, is by definition solely 'pagan' (according to their understanding of that term, usually a markedly twentieth-century one), and that Christian writers have no business caring about it. In their view, the Christianized nature of a festival like Lammas is a kind of false shell within which the 'real' festival is somehow hiding. The nastier ones accuse me of deceitfully concealing this 'real' paganism for my own nefarious ends - they demand that I produce the secret pagan texts I'm hiding, and are never put off by the inconvenient fact that such texts simply don't exist. There is an presumption of bad faith, and they are determined to believe the worst both of me and of the medieval writers. In their imagination, someone like the Anglo-Saxon monk who wrote down the Lammas charm becomes part of some vast and wicked Catholic conspiracy, rather than a fairly ordinary product of his time, place and education. What they can never seem to accept is that much of what modern audiences view as 'pagan' - solstices, the healing power of plants, astrology, and so on - were standard parts of medieval science, religion, and medicine. They were subjects of learned as well as popular interest, which even the most orthodox Christian writers accepted without question. (Not because they were too stupid to know better, but because their view of such learning and its sources and purpose was simply different from our own.) When people object to medieval Christians 'stealing' concepts they think of as pagan, it's often because they are projecting back onto the past a very modern view of such matters, one ingrained with suspicion of the catholic (and Catholic) nature of the medieval church. The truth is, of course, that though the roots of a festival like Lammas, or other frequently cited 'pagan festivals' like Easter, are likely to be pre-Christian, we have very little (if any) firm evidence for how they may originally have been celebrated. What we do have is abundant evidence for the celebration of seasonal festivals over the many centuries which followed, which provide a fascinating insight into medieval (and later) culture and custom, both learned and popular, involving important aspects of local identity and history and a diverse range of communities and their self-governance. Lammas lands and 'latter Lammas' are not pagan by any definition, but they're part of the history of Lammas too - not more or less important than the putative pre-Christian festival, though much better attested. It doesn't make sense to argue about what the 'real' Lammas is - it's all real. The idea that interest in the natural world is inherently pagan is one which would have made no sense at all to most medieval writers, or for that matter to most people for centuries after the end of the medieval period. It's a feature of an urban and post-industrial society to think that noticing and caring about natural cycles is an optional extra, or some esoteric magical secret - in fact, it's a modern luxury to be able to ignore them. We have light available to us, every hour of the day, at the flick of a switch, and so some people fiercely believe that only super-spiritual cosmos-attuned pagans could ever have thought to care about full moons and solstices. Go back even a hundred years and that's nonsense, of course; there was a time (and there are still many places) where solar and lunar cycles were unavoidably important, where moonlit nights were the only time it was feasible to go out in the evening and the lengthening or shortening of the days made a huge difference to the routines of daily life. Of course people knew when Midsummer was, and found ways to celebrate it - it's not exactly a mystery! It's a failure of imagination not to realise that this is one of the ways in which the past (even the quite recent past) was very different to the present, and it's a very modern kind of arrogance to think that it takes some special deep insight to notice or care how the sun works. This is especially true of the harvest and a festival like Lammas. In an agricultural society the harvest affects everyone - it's not an optional extra or a mystic observance. You don't even have to go back to the Middle Ages to become aware of this - think of Mary Crawford in Mansfield Park, oblivious that it's unreasonable to expect to hire a cart in the countryside in harvest-time because she holds 'the true London maxim, that everything is to be got with money'. Today many of us are more like than Mary Crawford than the farmers she offended; we're fortunate enough to be able to obtain food of whatever kind we like, all year round, without having to worry about scarcity or season, and that makes harvest festivals seem like nothing more than a nice decorative adornment to the calendar. But we shouldn't forget this is a modern and a privileged perspective, and we shouldn't impose it back onto the past. Everywhere you look at the moment, you see people projecting their fantasies back into history, rather than allowing the past to be different from the present. This comes from people across the political spectrum, but what they all have in common is that they only really care about history as far as it serves modern political goals. They're only interested in the past to the extent that it supports their modern prejudices, whatever those happen to be; they can't or won't face it on its own terms and by its own lights. What doesn't fit, they choose to ignore. The people who angrily object to the idea that Lammas has a Christian history as well as a pagan one have their own fantasy, of a homogeneous, 'pure' paganism, and they want me to provide for them a version of Anglo-Saxon culture with the nasty Christianity taken out - not because they care one jot for pagan beliefs or the mystery and glory of the cycles of the earth, but because they want grist to the mill of their political opinions. Of course I don't demand that such people take an interest in the later history of the festival - they can be interested in whatever they like! - but I do object to them insisting that I, in writing about medieval texts, suppress or distort what the sources actually do give us because they don't fit with a modern fantasy. The past - at any particular place and any particular moment - was very different from the world you know. Let it be different. Let it be what it was, and not what you want it to have been. If you'd asked your average Anglo-Saxon monk or medieval villager whether celebrating the harvest was a Christian or pagan thing to do, I wonder whether they would even have understood the question. It's the harvest; it matters to everyone. No one stole it from anyone, because it belongs to everyone. Of all British festivals, Lammas is perhaps simultaneously the most local and the most universal. Throughout its long history, and in its different forms, it has been a name which honours what we all need ('peoples everywhere', as the Menologium says): the fruits of the earth, and our daily bread. What a great informative article! And still a time for county fairs. This is just gorgeous--thank you. :-) I am sharing it on FB. 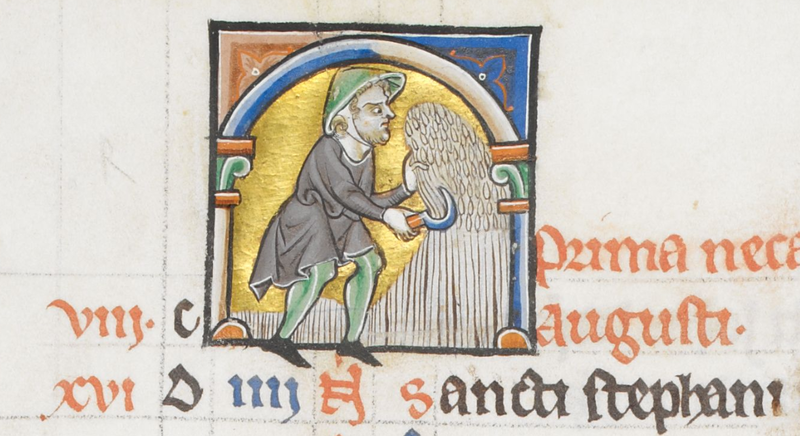 I wonder whether climate change caused the loaf-custom to die out; whether in the cool-down from the medieval warm period, the harvest season moved to later in the calendar year so that loaves made from the newly-cut winter wheat were no longer available by August 1st.